Welcome to the First Class Kickstarter Project! 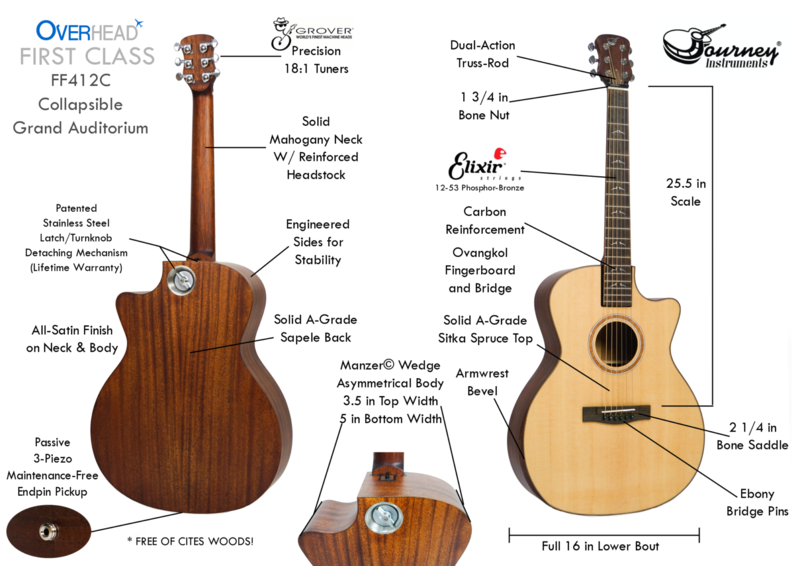 The First Class line is our new premier line of wood travel guitars. To maximize market exposure and speed up development time, we’ve decided to launch on KickStarter! For information on the KickStarter Program as well as what kind of cool rewards we have in store, click the graphic above. These 3 guitars are designed to bring an entire new level of experience for guitarists-on-the-go looking for professional stage-worthy instruments with the best portability imaginable. Thick Manzer© Wedge asymmetrical body designs make for super-comfortable playing that reduces stress on shoulder and wrist joints by angling the guitar in a way that makes fretting and strumming more ergonomic. Mini Armrest Bevels enhance comfort for the strumming arm, and reduce fatigue for finger-style playing, yet don’t reduce tone by shrinking soundboard space. Solid Tops and Backs with Engineered Sides to give the best of both worlds – both the satisfying tone of an all-solid wood guitar, and the increased stability of layered sides that prevents shifting and risk of split sides common to all-solid acoustic guitars. Patented Stainless Steel Latch Mechanism with Carbon Reinforcement make for a super reliable neck attachment with a substantial increase in energy transfer and sustain. Guaranteed for Life. 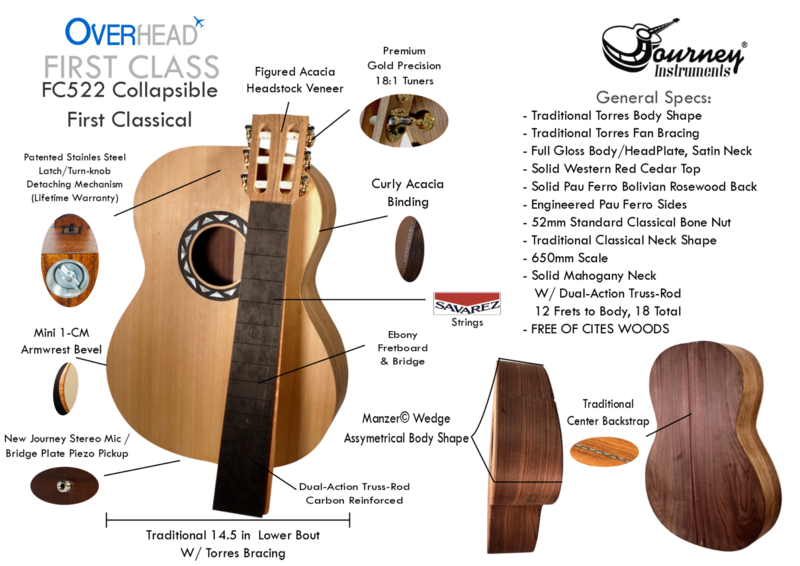 CITES Free Woods used on all First Class guitars, which means you can travel in any country without worrying about customs restrictions on wood types. Efficient and Optimized Case Design makes it a joy to travel with, perfectly organizing all you’d bring for a live performance, business trip or family vacation. Backpack Case that’s actually comfortable with thick padding on backpack straps – perfect for the backpacker or motorcyclist. Our Overhead guitars are renowned for their killer travel cases, and the Overhead First Class cases are a truly innovative upgrade. Our cases conveniently stow the neck and body safely and securely for maximum protection and enable full assembly IN SECONDS. 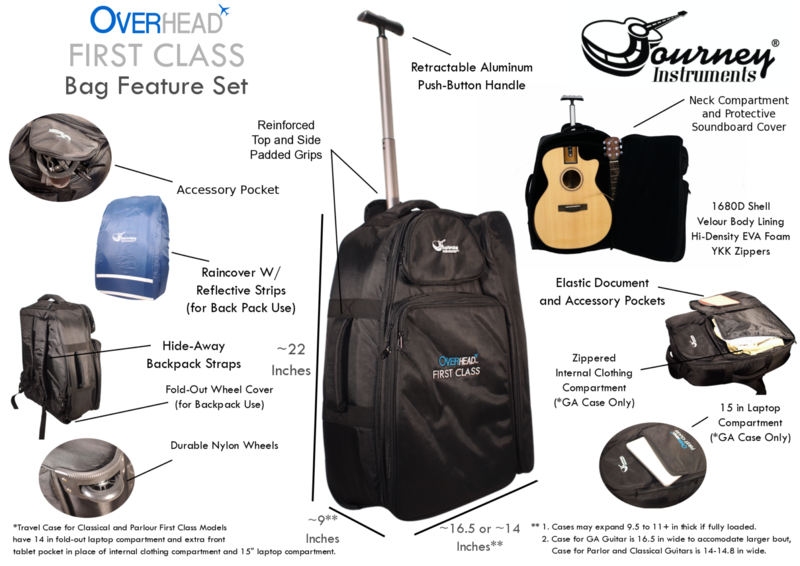 The First Class case gives you premium nylon wheels and a telescoping aluminum handle – letting you glide your guitar in a compact case with ease. And if you prefer, the hideaway backpack straps and cushioned wheel-cover panel make this case comfortable for trekking up and down stairs or around trails. The GA model case features a zippered clothing compartment as well as a padded laptop compartment big enough for a 15″ laptop. The Classical and Parlor model case substitutes these features with a fold-out computer compartment for 14″ laptops, and a front tablet pocket. All First Class cases feature top and side reinforced grips, a zippered accessory pocket, elastic pockets under the fold-out computer compartments, room beside the neck pocket for extra cables, and an optional rain cover. The Goal in designing the FF412C was to build the biggest sounding, most comfortable, and easy to transport Grand Auditorium guitar in the world. 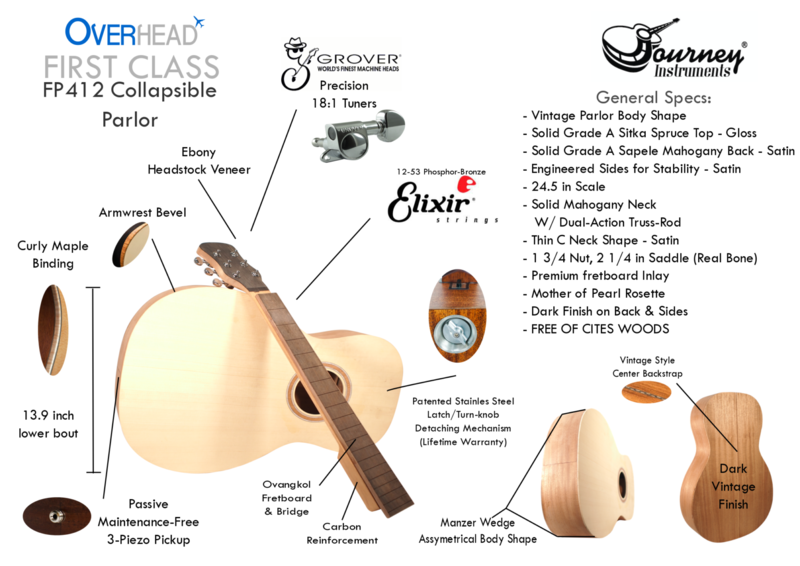 In addition to the First Class case and features mentioned above, it features a full 25.5 inch scale, 1 3/4 bone nut and saddle, an arm bevel, full satin finish, premium appointments, and and thick Manzer Wedge© that makes for the most comfortable, fullest-sounding Grand Auditorium guitar around! This is the perfect guitar for artists who want a huge-sounding, super-comfortable, Full-Sized GA guitar that packs small and travels like a dream. The FF412C is in production phase and should be shipping around December 2018/January 2019. The FP412 is concurrently in the sample finishing and production phase, and is scheduled to ship in February – March 2019. (Current picture shows a semi-finished guitar – we’ll post the updated photos during the campaign.) The FC522 was designed in response to our sponsored classical artists’ request for us to make a performance-grade, beautiful classical guitar with optimal ergonomics and stellar tone and volume, while implementing our collapsible technology. It has a full 650mm scale with standard 52mm classical nut and it has a traditional Torres body shape and bracing, yet with the wedged body. Featuring a solid Western Red Cedar top paired with a solid Pau Ferro Bolivian Rosewood back and engineered sides, the FC522 has curly acacia binding, a mini armrest bevel, and full gloss on the body and the figured acacia headstock plate. The thicker Manzer Wedge© makes this classical a delight to play with surprising comfort and satisfying tone. It comes with our active bridge plate piezo/mic pickup with tone control. The FC522 is concurrently in the sample finishing and production phase, and is scheduled to ship in February-March 2019. We are in the final stages of testing our new active stereo pickup system for this model, which we expect to complete in early December, and move straight into production. For Special Rewards like foldable travel caps, our new snazzy t-shirt, and our travel guitar kit, be sure to support us on our Kickstarter Page, as these are currently unavailable on our website.